Completely integrated: RF transmitter, GPS and RF antennas, GPS Module, and battery all in one small package. Lithium-Poly battery lasts for more than 8 hours. Range: 20 miles line of site. Transmits latitude, longitude, altitude, course and speed. There are many, many people who have flown my transmitters in high altitude balloons. Most fly the two meter version to make use of the APRS infrastructure. Some have used my 70cm transmitter (that was originally intended for high power rocketry). It is frequency agile, and can be set to 434.000 Mhz. It’s max output power is 16mw, but can be turned down to 10mw. You can look at this page: http://www.s3research.com/flightdata/ and look for a device type of APBL10 — that’s the identifier assigned to my devices. Ron Meadows (K6RPT-11 (CNSP)) Has flown these a number of times, and flew from california to Europe a couple of times. 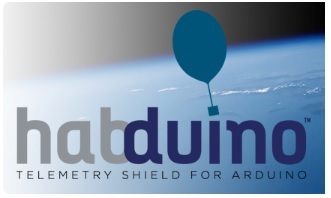 HABduino is the first ‘Off the shelf’ radio tracker to come to the marketplace. It should open up radio tracking to a wider section of the HABing community. • Compatible with Duemilanovo, Uno and Leonardo boards. • On board step up to permit operation from 2 x AA batteries. • Ublox MAX6/7 GPS designed for high altitude use. • 70cms frequency agile TCXO equipped transmitter for RTTY. • Optional 300mW 2 meter transmitter for APRS. • Interupt driven simultaneous APRS and RTTY transmission. HABduino has been given the thumbs up by those HABists who have used it but you will also need to buy an Arduino Uno micro controller, suitable antenna, and Funcube dongle for your laptop to get the best out of HABduino. This more than doubles the initial outlay. You also have to solder up an aerial but it is worth it. The Micro-Trak AIO (All In One) is a complete, self-contained, rugger, water resistant, portable, 10-watt APRS tracker, including a frequency agile 2-meter transmitter, a TinyTrak3 controller chip, a Byonics GPS3 GPS receiver, and an SMA antenna. The MT-AIO was designed for ease of use. It operates using 8 conventional AA batteries or a 12V power supply, and comes pre-configured with your callsign, so it is ready to go. 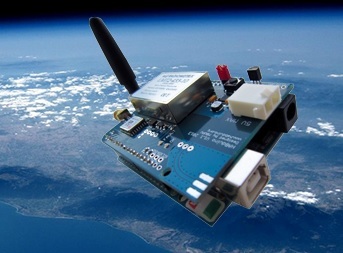 Simply connect the antenna, and add batteries, and you are on the air! The MT-AIO has been confirmed to run nearly 8 days when used with typical AA alkaline batteries, transmitting every 2 minutes. While SmartBeaconing is an option, it is not recommended, since that setting requires the GPS to be constantly powered, and battery usage will be limited to only a day or two. The MT-AIO weighs 14 oz without batteries, and is available with your choice of our Micro-Trak V2 Rubber Duck Portable antenna, or our Micro-Trak V3 Mag Mount Vehicle antenna. 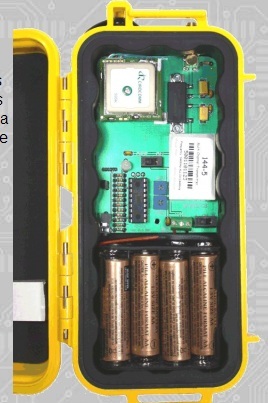 These units are designed for vehicle tracking, utilising the APRS system, but have been used extensively in America for HAB tracking (a good example can be found here http://jhabproject.com/parts-list/ ). With your UK amateur radio licence you can track vehicles with this unit but you cannot track HABs. 9(3) Without prejudice to Clause 1 of this Licence, the Licensee shall not establish or use the Radio Equipment in any Aircraft or other Airborne Vehicle. This is why members of the UKHAS use the license exempt 70cms band in the UK. Microtrak has other drawbacks. With batteries, the unit is about 600g with batteries. This is a shame as the units can be programmed with your amateur radio call sign and the frequency of the module.